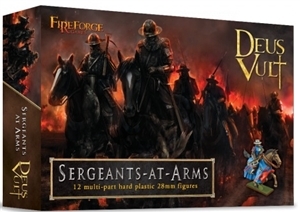 Fireforge Games – Sergeants at ArmsThis box set contains twelve 28mm multi-part plastic Sergeants at Arms with a mixture of barded and unbarded horses. You can build several types of Sergeants with a choice of many weapons among which you’ll find crossbows for assembling Mounted Crossbowmen units. Figures are supplied unpainted and require some assembly.The box contains enough plastic bases for Deus Vult gaming system:50mm x 50mm = 3 bases25mm x 50mm = 6 basesFigures are supplied unpainted and require some assembly.